How might Indigenous governance systems contribute to changing our relationships with each other and to the land and waters? 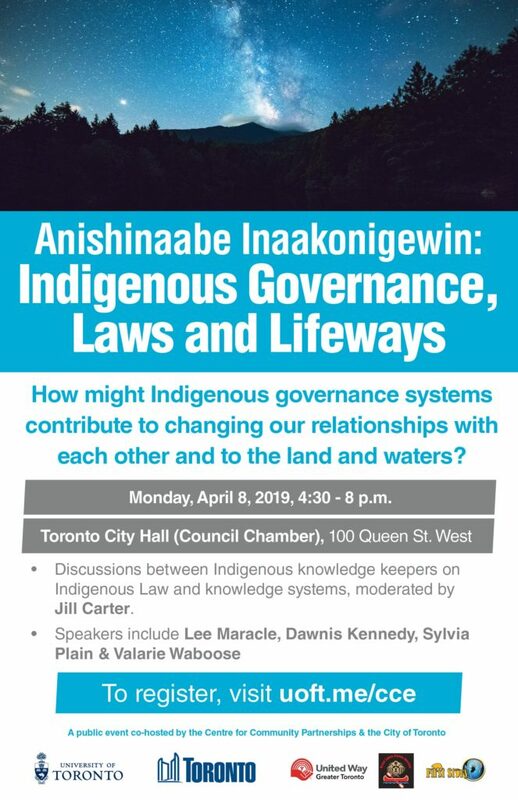 Join us for an evening of learning and conversations featuring Indigenous knowledge keepers on Indigenous Law and knowledge systems, including Lee Maracle, Dawnis Kennedy, Sylvia Plain, Valarie Waboose, and others, on Indigenous governance in the city, and our shared responsibility to care for the land and waters. This FREE event is open to the public and refreshments will be served. From January to December 2019, Toronto Public Library is hosting ENAGB Indigenous language classes at four branches (Danforth/Coxwell, Gerrard/Ashdale, Malvern and Mount Dennis). These classes, specifically structured to provide support to all families who are expecting or have children under six years of age, have been designed and are being delivered by the Native Canadian Centre of Toronto. The purpose of the program is to support language preservation and revitalization, and to provide a safe learning environment for Indigenous families and a learning opportunity for non-Indigenous families. It is funded through a federal grant and is part of a national strategy to preserve Indigenous languages. The Library’s role is to provide a safe and welcoming space for communities to learn. Four Indigenous languages (Inuktitut, Cree, Ojibway and Mohawk) are taught in weekly, 30-minute sessions. Pronounced “Enag-Bee”, ENAGB is an acronym based on Eshkiniigjik Naandwechigegamig, which means “a place for healing our youth”; and Aabiish Gaa Binjibaaying, which means, “where did we come from?”. Each branch offers classes in Inuktitut, Cree, Ojibwe and/or Mohawk. No registration required for Inuktitut, Cree and Ojibwe. Please register with the branch for Mohawk.